With the exception of the rose, no other plant is so widely distributed and at the same time so universally admired as the Violet. Not alone is it esteemed because of its beauty and fragrance, but a wealth of romance, of historical associations, and mythical lore have clustered around the purple blossoms, endearing them to the poet and scientist alike. 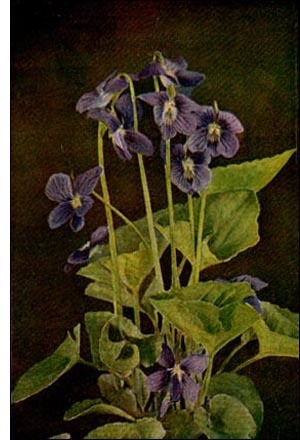 The violet was formally baptized with the ancient Latin name Viola in 1737. Since that time, by some strange oversight, botanists have allowed the name to remain unchanged. Two hundred and fifty species of the violet have been described, although a more careful study of the genus has reduced the number to one hundred or more species. Three-fourths of these forms are found in the temperate Northern Hemisphere and the balance in the southern. Under these diverse conditions of growth the plants assume many seemingly unnatural characteristics. Thus, in Brazil, a species of violet is eaten like spinach, while others found in Peru are violent purgatives. Among certain Gaelic tribes the plants are highly esteemed as a cosmetic, and the ancients largely used the flowers to flavor wines.